I really wanted to write about my first week back to teaching after a year-long sabbatical, but I haven’t had time. Maybe I’ll write about my first *two* weeks later on this week. Why yes, I think Pippi looks *just* like Johnny Depp, don't you? I feel sorry for those non-famous people — they’ve just been called a dog! (Johnny can handle it. He lives on his own island, after all.) But at least they’ve been compared with a pretty dog. Don’t be too impressed, btw, that Google found another picture of Pippi on the old version of my blog and matched it with the one I entered. 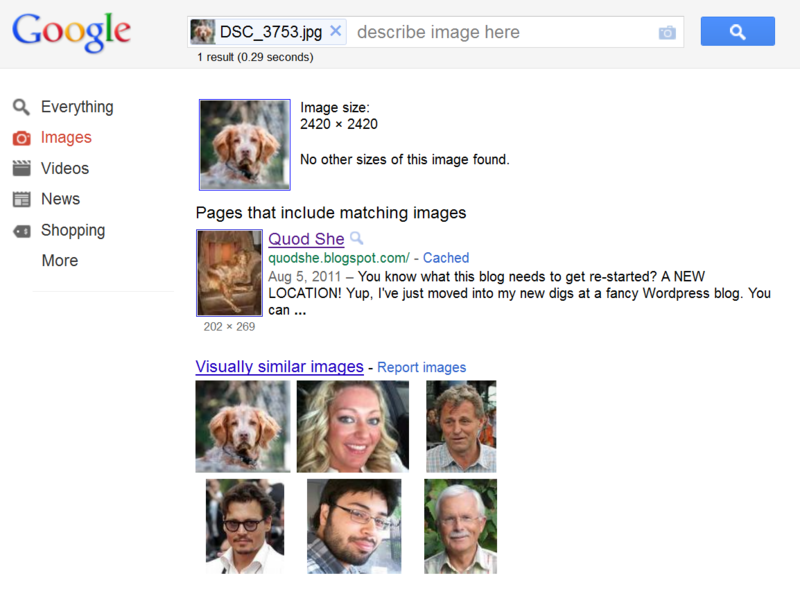 Not only do both URLs have “quodshe” in them, but just before this search, I searched for the very picture that appears on the front page of the old blog, so I think Google was learning. When I put in pictures of Pippi that I *haven’t* blogged or posted on G+, it couldn’t find the pictures of her that *were* out there. And in that case, too, it matched her with people, not dogs. Well, see, that just proves that Pippi is people, too! That’s the way we think of her around here anyway! I know I’ve posted this before, on the old incarnation of my blog, but it’s *always* worth seeing again. Plus the embedded YouTube videos didn’t transfer over and I needed an excuse to learn how to do them here. I love the fact that Statler and Waldorf have eased so effectively into comment thread cranks. There are more where these came from. >This is so cool. Back in October and November, a group called Illuminating York did a series of art installations and performances all around the city of York, England. The first link takes you to pictures and video of Evoke, an interactive project that lit up the Minster’s western facade with moving rainbow lights set to operate in response to people’s voices. The pictures are great but the video is even cooler. In it, singers, screaming kids, clapping crowds, and the sound of children’s feet on the steps to the entrance all send undulating light projections crawling up the face of the Minster. I love the fact that it makes tangible the idea of voices being sent into heaven through the magisterial, soaring heights of the Minster. And be sure to watch the video through to the end, where the lights change into something more eery and uncanny. I have to say though, I don’t get where the writer of the post is coming from in describing York Minster as “usually dark and gloomy.” Maybe they just mean at night, because York has always struck me as the airiest and lightest of medieval cathedrals, owing in part to its light stone (is it limestone? I can’t remember) and its late medieval architectural techniques allowing for greater height and more windows. It’s so powerfully beautiful that my mother gasped when she first entered it back on our first trip there in 1986. Though never a fan of religious art — though she always visited every cathedral in every European cathedral city we traveled to! — even my atheist mother understood viscerally the potential effect of the place for someone who does believe. For her its beauty was powerful enough. I imagine living in York it would be easy enough to take the Minster for granted, but a display like this reanimates but also repurposes its beauty and meaning. Illuminating York is illuminating in all senses of the word. Well done!